Right now, certain real estate stocks are trading at ridiculous basement prices. Particularly, Brookfield Property Partners (TSX:BPY.UN)(NASDAQ:BPY) is absolutely attractive. Instead of investing in a property, you can invest in Brookfield Property, which is much more diversified with about US$171 billion of assets under management. With the expectation of higher interest rates, many already high-yield real estate stocks have been pushed down even further, creating even bigger yields. Brookfield Property is lumped in with this group of real estate stocks — I believe wrongly so. 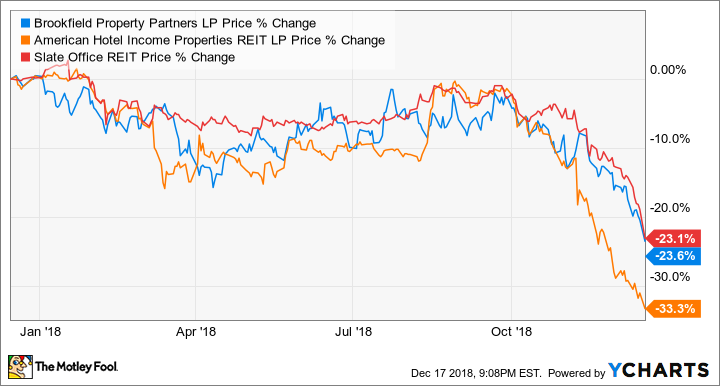 Brookfield Property stock lost about 23% in the last 12 months and 19% in the last three months, while Slate Office and American Hotel stock fell 23% and 33%, respectively. I’d warned about the latter two stocks in November. BPY.UN data by YCharts. The price action of TSX:BPY.UN, SOT.UN, and HOT.UN in the last three months. Brookfield Property isn’t the same as certain high-yield real estate stocks. It has the ability to maintain and even grow its dividend. It aims to increase its cash distribution per unit by 5-8% per year with a target payout ratio of about 80% of funds from operations. This payout ratio doesn’t include the margin of safety that arises from sales in mature assets. Brookfield Property is always on the lookout for value opportunities in the geographies that it operates in, including Canada, the United States, Brazil, Europe and the Middle East, and the Asia Pacific region. This way, it can aim for the highest risk-adjusted returns. It looks for deals in capital-stressed markets, and it has the operational expertise to redevelop or re-position properties for higher returns (either raising rents or selling assets when they mature). Most recently, Brookfield Property completed the acquisition of GGP, which owns 8% (122 million square feet) of the U.S.’s high-quality malls. GGP’s quality is evident by its recent net-operating-income-weighted occupancy of 95%. Brookfield Property can improve the retail properties, but it’s going to take time. I believe Brookfield Property is the baby that is being thrown out with the bath water. As the company continues to execute its long-term value-creation strategy and increase its dividend, the stock will eventually turn around. While gross rental yields in Toronto and Vancouver are roughly between 3.8% and 4.7% according to Statista, income investors can get a yield of about 8% from Brookfield Property. Real estate is a long-term investment. Investors need to treat Brookfield Property as a long-term investment, too. In my opinion, it’s a no-brainer to buy Brookfield Property to lock in a big, growing income. Fool contributor Kay Ng owns shares of Brookfield Property Partners. Brookfield Property Partners is a recommendation of Stock Advisor Canada.